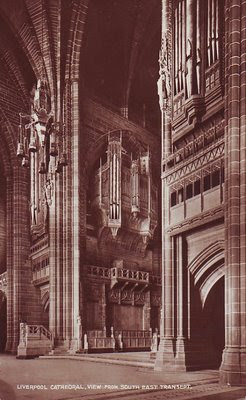 This glossy real photograph sepia postcard of Liverpool Cathedral was produced by Valentine’s Co. Ltd, a family run business which lasted over several generations from 1825-1963, first in Dundee, Scotland, then London, England. The title Liverpool Cathedral View from South east Transept is hand written on the front of the card. The card was posted from Liverpool to Weston-super-Mare on 1 April, 1929.